Velcro knee supports can provide basic or advanced support and protection for the most common causes of knee pain. They are really easy to use, fastening with simple Velcro straps to provide the right level of support and compression required. 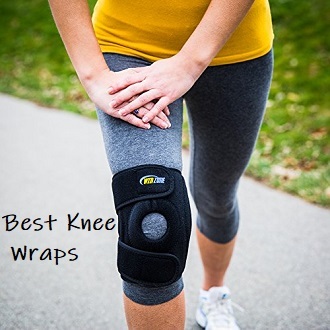 2)	Longer term use: with ongoing knee conditions causing mild to moderate knee pain. Velcro knee supports fit snugly providing some compression to the knee which helps support the soft tissues (muscles and ligaments). They also retain heat which increases the circulation to the knee and helps to promote healing. They provide either basic or advanced support depending on the design. Advanced Velcro Knee Supports: Ideal for providing moderate levels of support and reducing the forces through the knee for e.g. mild-moderate sprains/ligament tears, arthritis, cartilage tears, runners knee, chondromalacia patella, osgood schlatters and patellar tendonitis. 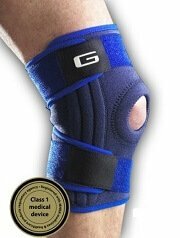 Overview: This is one of the most popular McDavid knee braces on the market. It has special supportive steel springs that strengthen the brace on either side of the knee joint to improve stability and support knee ligaments. The neoprene material provides soothing heat and compression which relieves knee pain and swelling and promotes healing. 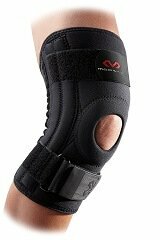 My verdict: The McDavid Patella Knee Support is a classic design and it is rated highly by users. McDavid is a trusted brand worldwide so you can’t go far wrong. If you are looking to get a bit more support than a classic pull up design, it is well worth the money. Average user rating 4.1/5. Overview: This Neo G velcro knee support improves stability by eliminating unwanted gliding and twisting at the knee. The brace ensures that any weight going through the knee is distributed evenly. It has a hole at the front with a stitched buttress giving reinforced support to the patella and anterior knee. The Neo G Open Patella Support is a Class 1 medical device registered with the Medicines and Healthcare products Regulatory Agency. My verdict: A good, simple yet effective knee support. I am a big fan of Neo G braces. They receive excellent reviews and have recently become available worldwide, originating from the UK. Average user rating 4.4/5. Overview: This Velcro knee support provides compression, support and warming relief to the entire knee complex without restricting movement. At only 2.5mm thick, it can easily be worn under your clothes, providing dynamic support whilst still allowing full range of motion in all directions. My verdict: The Neo G Closed Knee Support provides good basic level support and stays in place really well, unlike some other knee braces. 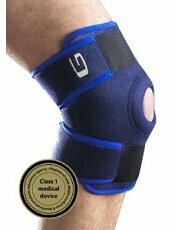 Reviews are extremely positive however if you have problems with your kneecap, the open sleeve may suit you better. Average user rating 4.3/5. 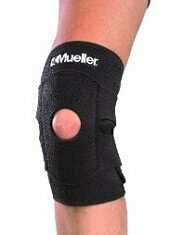 Overview: This Mueller velcro knee support is lightweight and adjustable providing firm, comfortable compression without restricting movement. It is perfect for weak, injured or arthritic knees. Four patented Velcro straps provide controlled compression and a perfect fit for your knee - especially helpful if you knee is prone to swelling. The open kneecap design helps stabilise the kneecap without putting any pressure through it. Its contoured design and Velcro cover minimises bunching and prevents friction behind the knee. Soft neoprene blend retains heat for soothing warmth to help relieve pain and promote healing. My verdict: People find the Mueller Wrap Around Knee Support really comfortable even when worn all day. Doesn’t cause any restriction behind the knee like some pull on sleeves do. Average user rating 4.1/5. Overview: Adjustable neoprene ace knee brace with adjustable straps for controlled compression and a perfect fit. It is open at the front with a support buttress to improve patella tracking whilst reducing pressure through the kneecap. My verdict: This is a good, mid-level knee support. Users regular say they find this brace comfortable, supportive and sturdy. Average user rating 4/5. Overview: This brace provides great support and compression, and has metal spiral support stays to stabilize the knee whilst allowing controlled movement. It is particularly good for sports and skiing. The open patella area helps reduce pain associated with patella tracking problems, and offers relief from bursitis injuries and inflammation. The Neo G Open Knee With Patella Support has three adjustable straps which allow variable compression and ensure a custom fit around the entire knee complex. My verdict: This is one of the best knee braces on the market offering intermediate support and protection and is my favourite Neo G brace. It is very reasonably priced and it proves that knee braces don’t have to be cumbersome to give great support. Average user rating 4.3/5. Overview: Flexible dual side stabilisers provide support and medial/lateral stability with all activities and allows full range of movement whilst delivering comfortable support and protection. It is open at the front to improve patella tracking whilst reducing pressure through the kneecap. It has adjustable straps to ensure optimum fit and prevent slipping. The comfort fit sleeve reduces irritation behind the knee, and breathable material keeps you cooler and drier. Antimicrobial treatment inhibits growth of odour-causing bacteria. 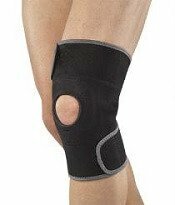 My verdict: Some people find this brace uncomfortable as the middle strap behind the knee can rub and restrict movement. Average user rating 4.1/5. Choosing a knee brace can be difficult, especially as there are so many different braces on the market. Wrap around Velcro knee supports are just one of the options out there. Their main advantage is that you can adjust them to ensure a perfect fit, particular useful if your knee tends to change shape and size due to swelling. Pull Up sleeves provide great basic protection and hinged knee braces are great at providing Elite protection. 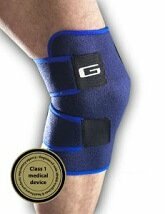 You can also get knee straps which target the kneecap and patellar tendon. 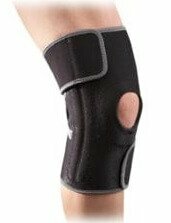 To find the best knee brace for you, visit the knee brace section to find out about the different styles of brace available, what conditions they are suitable for, and which ones get the best reviews from users.